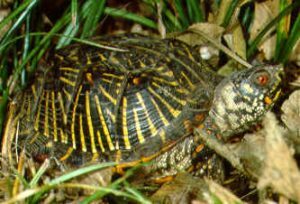 The Ornate Box Turtle is one of two turtle species on the Great Plains that are terrestrial. The other land-dweller is its close cousin the Eastern Box Turtle (Terrapene carolina), whose range covers most of the eastern United States and includes the tallgrass prairie from Kansas to Texas. The Eastern Box Turtle's lower shell is olive drab in color, which readily distinguishes it from the complicated color pattern of the Ornate's. The word "ornate" means elaborately decorated. As you can see in the pictures above, this animal's shell does have a fancy look to it. Each shell segment (scute) has a radiating pattern of yellow lines on a dark brown background. This may be seen on both the upper shell (carapace) and the lower shell (plastron). If you happen to come across an Ornate Box Turtle, you can find out a couple of things quite easily. Its gender. The coloration of box turtles is highly variable, but in general, males have bright red or orange eyes and this color is usually repeated on the front legs, face, and neck. In females, the color in these areas will usually resemble the yellow of the stripes on the shell. A female will be slightly larger than a male of the same age, and the male's plastron will usually be slightly concave. Its age. If you look carefully at the scutes on the carapace, you will see annual growth rings. Count them up and you have a pretty good idea how many years old it is. Box turtles may live over 30 years. 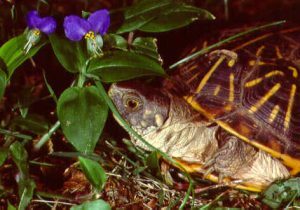 The Ornate Box Turtle is active from April through October. It may spend its entire life within an area of only a few acres. It begins its day by basking in the sun. After getting warmed up, it goes looking for food. A box turtle on the hunt is fun to observe. They have an earnest determination that is quite admirable. It likes to eat insects, spiders, worms and some vegetarian fare such as berries. In cow pastures, box turtles may often be found around dung piles looking for beetles! They lay their eggs in early summer. The female will dig a hole with the strong, curved claws on her hind feet and lay 2 - 8 white eggs in it. The eggs are about 35 mm long. She does not guard the nest. The eggs will hatch in a couple of months. Some females will lay a second clutch later in the year. These may not leave the nest until the following year. A baby box turtle is about the size of a quarter. For a short time after hatching, the shell is slightly flexible and a navel may be seen in the middle of the plastron. It is, without a doubt, one of the cutest things you will ever see! In autumn the box turtle will seek out a place to bury itself for hibernation. Using their stout claws, they dig themselves into the earth and prepare to shut down for the season. Often they only get a few inches below the ground surface, but that is enough apparently to get them through the cold prairie winter. The Ornate Box Turtle may be found from South Dakota to southern Arizona and the Rio Grande Valley. The Mississippi River generally marks the eastern boundary of its range. It prefers prairies and pastures to woodlands. What makes box turtles so unique is the hinge in the plastron. This allows them to completely withdraw their legs, tail, head, and neck within the shell for protection from predators. If a coyote, raccoon or fox tries to make a meal out of a box turtle, it will not find anything to nip at. 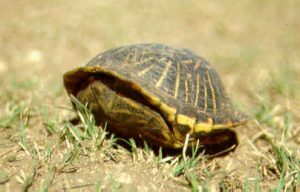 The sturdy shell protects the turtle until its enemy gets frustrated and goes away. A few aquatic turtles have hinged plastrons, but most do not. Aquatic turtles are almost always near water, which allows them a quick escape from danger. Shut tight! Unfortunately, the shell does not protect turtles from cars and many are killed as they try to cross roads. Indeed, this is the major cause of death of adult box turtles in some areas. Please watch out for these harmless little creatures as you motor across the Great Plains. You might even consider stopping and giving them a safe ride to the other side! Be sure to hold them away from you when you pick them up, however. They don't know you have good intentions and, out of fear, will usually empty their bladder when picked up! Herp Vet Connection - for locating a veterinarian near you that specializes in reptiles and amphibians. Anapsid.org - for general care information on turtles. Before buying a box turtle or any other exotic pet, make sure it has been CAPTIVE BRED. Taking turtles and other animals from the wild for the pet trade is a serious problem. In Kansas, in fact, it is illegal to abduct turtles from the wild for resale. Help eliminate the market for animals stolen from their wild homes by buying only those creatures that have been CAPTIVE BRED.